Licensed Café. Live Evening Events. Sladers Yard is a private art gallery dedicated to exhibiting and selling contemporary British art, handmade furniture designed by Petter Southall and designer craft by leading artists, designers and makers. The gallery presents a high quality changing programme of selling exhibitions throughout the year. We sell work directly from the artist so customers know when they buy from us that the artwork is genuine and that the money they spend supports and provides a living for some of the most talented artists and makers working today. Between exhibitions we represent artists, often holding their paintings in stock and where appropriate we take and orchestrate commissions. Petter Southall Treble Zero Chair and Small Screen Desk in solid oak, steam bent curves. The changing exhibitions are accompanied by an ongoing and continuously renewed exhibitions of craft and accessories including ceramics, sculpture, glassware, leather and textiles by leading British designer craftspeople. Housed in an historic Georgian rope warehouse, with pillared galleries and flower-filled courtyard, it is five minutes walk from the beach and harbour in West Bay, Dorset. CAFE SLADERS serves delicious food throughout the year. See Opening Times. Come and try our new menu! View the menus and wine list. Regular and varied live evening events with dinners are a highlight. The venue is also available for catered private parties, weddings and celebrations. Upcoming Events. CAFE SLADERS is open every day 10am – 4.30pm serving sensational coffees, lunches, teas, cakes and cream teas as well as drinks and nibbles. View menus for daytime Café. Please phone 01308 459511 to book a table. To see upcoming evening events usually ticketed with optional dinner. 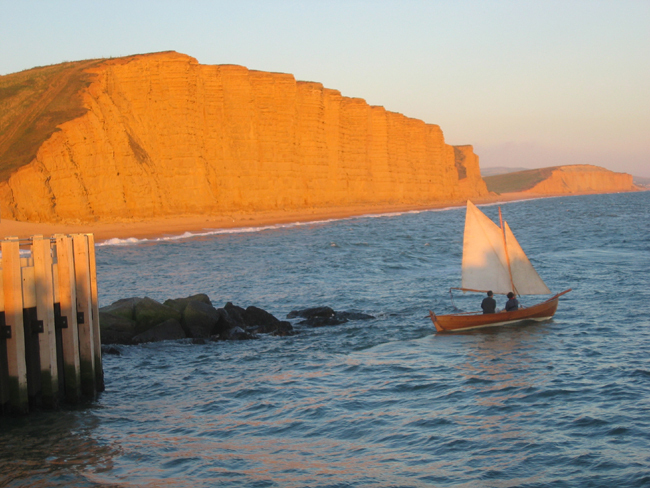 The Southall family in Petter’s Oselvar Faering off Burton Bradstock. Thank you for a super light lunch today. Esp the service given by the two young staff members present. Mike loved his ‘special’ chocolate drink. The mosey round the gallery was the usual pleasure. Have visited three years ago and am looking forward to seeing what will be on show this autumn. Last Saturday was very special. My favourite violin duo, Retorica, performing at Slader’s Yard, another favourite, coinciding with fantastic exhibition of works by Frances Hatch. What a Hat Trick! Thank you. It was marvellous, wasn’t it. And so great that you were able to be there too Joanna. Thank you for a quite fabulous lunch today with an inspiring hour and a half of jazz from the Ian Smith Trio and Vimala Rowe. I particularly appreciated Ian’s personal memories of Harold Pinter and learnt more about him than I ever hoped to know. Lunch was delicious and the welcome genuine. Thank you to all and to the Bridport Literary Festival. Thank you for your comment. We were proud to host such a special and high-quality event. Ian Smith and Vimala will be back at Sladers early summer next year! Superb exhibition of Philip Sutton’s work in a loverly setting with an excellent lunch. What more could you ask? Thanks. You can come again! 3 of us visited last Monday on our way from a dance weekend in Torquay and were very impressed with Petter’s furniture and also the artwork. The soup was great and I brought some delicious homemade Apple cake home with me. I will treat myself to a mirror or something as I have just moved to a new modern house near the sea. I will definitely pay you a visit in Spring if possible. Your drop-down list of artists goes off the bottom of my screen, otherwise I think that it is a nice site with interesting artists. Ian Smith Trio superb on Sunday, accessible poetry and creamy jazz. More of the same. Well done! Do you have contact details for them? Visited Sladers Yard recently. Petter Southall”s furniture absolutely amazing – the design and craftmanship. Seen nothing so inspiring since the John Makepeace exhibition. Thanks so much for your encouraging message.